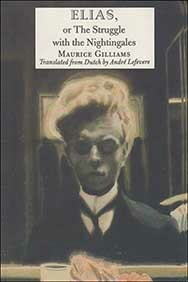 Born in 1900 in Antwerp, Belgium, Maurice Gilliams came to be recognized over the century as one of the great Flemish writers. His Elias -- published in 1936 as the first part of a trilogy which includes Winter in Antwerp (1953) and A Wedding at Elsinore (1982) -- is now read in most schools in Belgium and many classrooms in Holland. Elias, which reads as well as a separate novel as it does within the trilogy, is the story of the young Elias, who, sent to live within a large, mysterious house of aunts and uncles, grows up, less under the tutelage of the adults than that of the older cousin, Aloysius. While this is in many ways a traditional story of childhood, in Gilliams' hands the tale becomes transformed into a world of dark and foreboding adults who hover over in supposed love, while the children discover love within themselves. In upcoming seasons, Sun & Moon Press will publish the other two volumes of Gilliams' great trilogy.